Jason Scrivener has broken through for his first professional victory after pulling away from the field in the 2017 NSW Open at Twin Creeks Golf & Country Club. Scrivener teed off in the final group of the day with a one shot lead over Victorian Lucas Herbert and Queenslander Daniel Nisbet but streaked away to win easily by six shots after a round of 7-under par 65. He finished the tournament 24-under the card. It is a landmark win for the 28-year-old, who has been on the verge of his first professional win in the past. He has had three top-5 finishes on the tough European Tour this year alone, including a fourth place finish in the ISPS HANDA World Super 6 Perth. Despite his dominant win, he said it was tougher than it looked on the leaderboard. “It feels pretty good, I think it looked a lot easier than what it was; it’s hard work to win,” Scrivener said. The West Australian said the win gives him confidence in getting the job done should he find himself in this position again. Herbert would finish in outright second, signing for a birdie on the 18th to close out the weekend at 18-under the card. 2015 NSW Open Champion Ben Eccles (VIC) was outright third on 16-under. Chris Crabtree (QLD) and Blake Windred (NSW) round out the top-5 and were also the best placed amateurs finishing on 14-under. 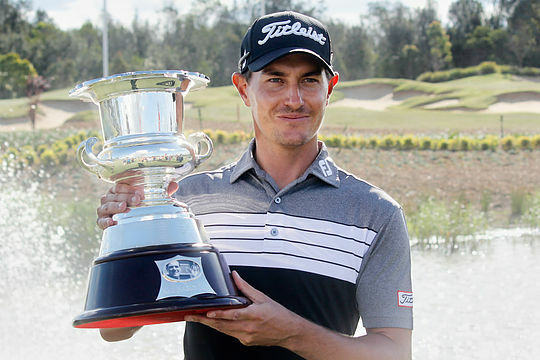 For his win, Scrivener picks up AU$72,000 and moves to 5th on the ISPS HANDA PGA Tour of Australasia Order of Merit. The ISPS HANDA PGA Tour of Australasia now travels to The Australian Golf Club for the 2017 Emirates Australian Open, 23 – 26 November.